Sunday June 5th 1921 I went with Hattie to Christian church to hear J Madison Williams preach. In afternoon wrote Nellie, Sue & Sallie Reed and Miss Elder. I sent a check to Earl Danner as I had given to each of the Hedges boys. Rode with Whetstones. Took Cora to west Liberty to go north in the evening. Monday June 6th 1921 There was nothing urgent to do so I did not get up till nearly noon. Hattie busy finishing a sweater. I wrote a long letter to Joe Woolf in afternoon. 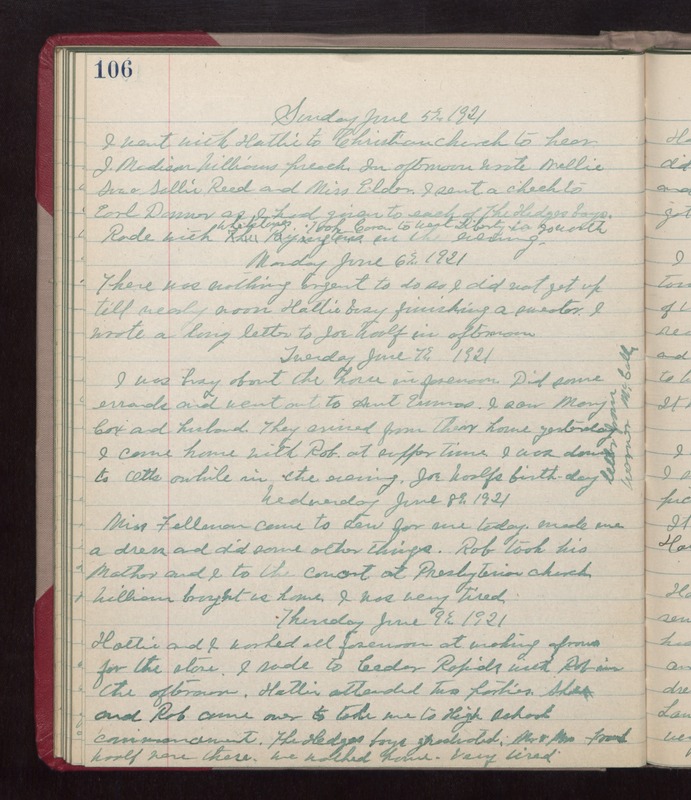 Tuesday June 7th 1921 I was busy about the house in forenoon. Did some errands and went out to Aunt Emmas. I saw Mary Cox and husband. They arrived from their home yesterday. I came home with Rob at supper time. I was down to Otts awhile in the evening. Joe Woolfs birthday. Letter from Warner McCall. Wednesday June 8th 1921 Miss Fellman came to sew for me today, Made me a dress and did some other things. Rob took his Mother and I to the concert at Presbyterian church. William brought us home. I was very tired. Thursday June 9th 1921 Hattie and I worked all forenoon at making aprons for the store. I rode to Cedar Rapids with Rob in the afternoon. Hattie attended two parties. She and Rob came over to take me to High school commencement. The Hedges boys graduated. Mr & Mrs Frank Woolf were there. we walked home. very tired.